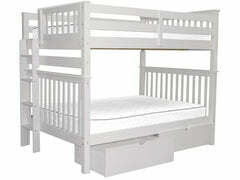 When looking for the right sleep solution for your child or children, the topic of bunk beds is bound to come up. This fun and classic sleep solution is a top choice for kids of all ages and offers the right mix of fun and function to keep everyone happy. When it comes to finding the right bunk bed for your child, there are certainly plenty of options on the market. Navigating this important purchase shouldn’t be a hassle or confusing. Finding the right bed for your child requires a little planning to get the right outcome. When looking at bunk beds for your child, you will notice that you have a choice between stairs or ladders as the method to reach the top bunk. While this may not seem like that big of a deal, there are a few things to consider when choosing between stairs or ladders. When choosing the right bed for your child’s room, there is no denying that bunk beds are a popular choice for all ages. While many children want the bed because it is a fun way to sleep and is perfect for sleepovers, parents are looking at things from a different perspective. When choosing the right sleeping solution for your child, you want something that lets them rest safe and sound. When it comes to bunk bed standards, there are a few important safety matters worth knowing before your purchase this type of bed for your child. When shopping for a new bed of any type, it is important to figure out the matter of sizing before you buy. Many people skip the important aspect of figuring out if the size is right and instead focus just on price. This can lead to discomfort and a bed that your child can’t grow into. When you design your room or that of your child, it is important to make certain considerations before buying the furniture. The biggest consideration with any furniture purchase is the matter of sizing. If you are choosing a bunk bed with additional storage built in, you will need to make more detailed considerations than a regular bunk bed. When it comes to shopping for any type of furniture, you always need to measure the room before you purchase the furniture. If you buy something that is too big for the space, you end up with a real problem. When looking to buy a trundle style bed, the matter of considering space becomes even more crucial. 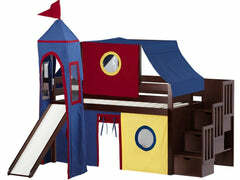 When it comes to getting the best bed for the needs of your child, the features play a big role. There are plenty of bunk beds on the market but that doesn’t mean they will be the right choice for you. When choosing the right bunk bed for your children, there are tons of options on the market today. While they may all seem pretty much the same to most people, there are actually a few important reasons to consider the differences in bunk bed layouts. When it comes to making your child's room a place of comfort and imagination, there are a few ways to go about the task. Since this is such a big task, it is a good idea to focus on specific areas as your starting point. When it comes to your child's room, you want to create a place that is more than just a place to sleep. A room should be a place to sleep, study, play, grow, and develop! If you are looking to create this type of room for your child, but aren't sure where to start, we have a few pointers. When you are shopping for the right sleep solution, you may think bunk beds are limited in their uses, but they are one of the most versatile beds on the market today. With their double sleeping space with minimal floor space taken up aspect, it makes sense to use this type of bed in your home. There is no denying that bunk beds are a kid-friendly sleep solution they will love for years of use. Practically ingrained in our minds as an important part of childhood, bunk beds are something they will love and remember forever. While your little ones may love their bunk beds, teens are a different story. If you are new to the world of bunk beds, you may have some questions about what makes up a bunk bed. While the obvious answer is that it’s one bed stacked on top of another bed, there are individual parts worth knowing when shopping for this sleep solution. While bunk beds are now a staple in modern home furnishings thanks to their playful fun and the way they save on space while maximizing sleep areas, they haven’t been around forever. Where is the starting point for the history of the bunk bed? When it comes to bunk beds, many parents worry about whether or not they are a safe sleeping solution for their children. While most bunk beds pass rigorous safety testing to pass inspection, there are still a few things parents can do to ensure a safe environment for their children. When you buy a bunk bed, you want it to last for years of reliable use. While a high-quality bunk made with durable solid wood is sure to give you years of use, there is no denying that accidents are bound to happen. When it comes to making the bed, it is usually a rather simple task that even a child can do once taught. 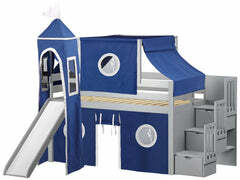 With bunk beds, however, the matter of making the top bunk can be somewhat complicated. When designing your child’s room, you want the right look for their personality and also the style of your home overall. If you are choosing bunk beds, there are plenty of options on important matters such as wood finish. When you have a bunk bed, it is important to take proper care of it to ensure a long life of use. There are different kinds of bunk beds on the market today and the steps for cleaning them aren’t all the same. If you are looking for tips on cleaning castle beds, we have you covered. As a parent, it seems every day is a battle on certain topics. When you have bunk beds, the fight over who gets the top bunk may be a near constant argument at bedtime. When it comes to choosing who gets the top bunk with minimal tears and fussing, here are a few things to consider. When it comes to your family, you want to keep them as safe as possible. 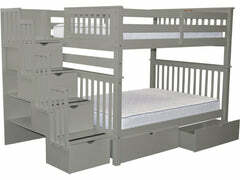 Many parents fear bunk beds aren’t as safe for their children as regular single story beds. The truth of the matter is that bunk beds pass through a lot of safety inspections before they are able to be sold to the consumer. As any parent knows, children can take a toll on stuff. With all their energy and playfulness, it is no wonder accidents happen that mar furniture. Aside from the little ones being a bit too rambunctious, wear and tear is a part of life with furniture, especially if certain steps aren’t taken to prevent it in the first place. When looking for a space-saving solution that gives your child everything they need for a great night of rest, bunk beds are the ideal solution. While you may be shopping for this fun sleep solution for your family, it can get confusing when you hear the terms bunk beds and loft beds used interchangeably. When choosing the right bunk beds for your children, you want to know your options. While you may see several styles on the market today when shopping for this item, they are not all created equal on important matters such as appearance, longevity, and durability. When choosing the right bunk bed for your child, the matter of the wood type is important. While many people think of the wood type as a secondary consideration to matters like appearance or sturdiness, the wood type plays a bigger role than you might think. When you choose the right furniture for your child, you want options that meet certain standards. A bunk bed is a fun way to maximize sleeping space while giving them a fun, iconic bedding option. There is a growing trend on the scene today of taking a DIY approach to creating a bunk bed. When you buy anything for your home, you probably look for quality to ensure a long-lasting addition. When it comes to furniture for your child or teen, you definitely need something that will last for years of use. Bunk beds are a great solution that lets you save on floor space and maximize sleeping space. When choosing the right bed for your children, there are plenty of options the market today. 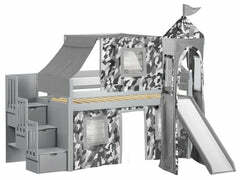 While there are other choices, there is no denying that bunk beds are the best of fun and function! 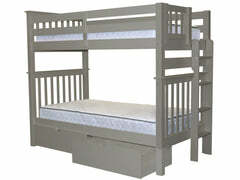 When choosing this type of bed, you have a choice between bunk beds that separate and those that are one piece. 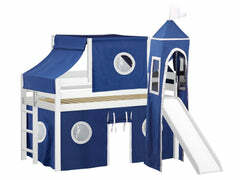 When looking for the right bed for your child, you want something safe that they will also enjoy. The safety part comes from choosing a manufacturer you can trust with certified safety testing in place. 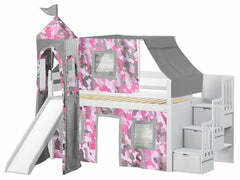 The fun aspect comes in bright colors to excite their imagination!